Matt 11:28-19 "Come to Me, all you who labor and are heavy laden, and I will give you rest. Take My yoke upon you and learn from Me, for I am gentle and lowly in heart, and you will find rest for your souls". People have burdens such as fear of losing jobs or not enough money for rent and they begin to ask what will I do if I lose my job, this causes people to lie, to change somethings and even cheat. Some men come home late so the wife has no joy and as she sits to eat the has no joy. Others have burdens of past mistakes maybe what happened will happen again, burden of I will never make it, burden of what can I do. 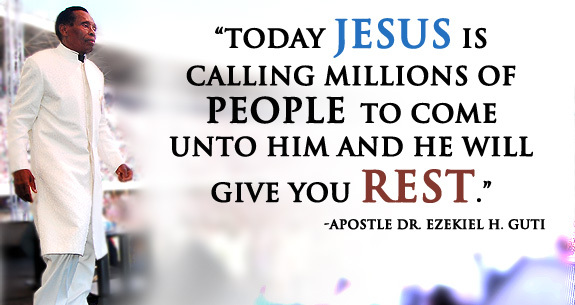 Today Jesus is calling millions of people to come unto Him and He will give you rest. People are weak because they are learning from the wrong people. Jesus says learn from me, when you learn from Jesus you don't have problems. He will give you rest for your soul.